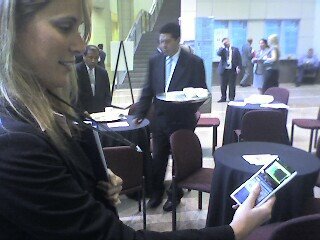 Stephanie demonstrates the "Cool Conference Gadget" of the week: nTAG's interactive identification tag. Instead of a paper nametag, some conference participants received a personalized digital nTAG. This nTAG, in addition to having the participant's contact information, also has an iPod-like interface with the conference agenda, local restaurant information, and "polling" features to allow realtime feedback on speakers and topics. The nTAGs also have an 802.15 interface for exchanging contact information with other participants (akin to my Palm "beam" function), for logging your presence at various panels and sessions, and for the realtime polling feedback noted above.